We are blessed with the third largest coral reef in the world, (after Australia's and Belize's Barrier Reefs). It extends southwards fom Miami for some 170 miles into the Florida Keys National Marine Sanctuary. 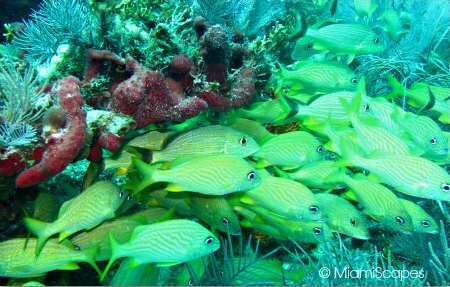 This wonderful ecosystem paired with our wonderful weather year-round, makes Snorkeling and Scuba Diving some of the most popular things to do in Miami that can be enjoyed any month of the year. So how do we get to the colorful reefs? Can we swim from the beach? Unfortunately, the coral reefs are about 3 to 8 miles offshore, although relatively speaking close to the coastline, it is not close enough so you can swim to them. 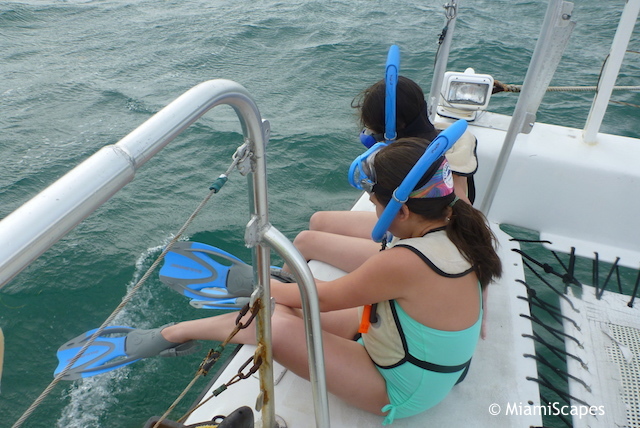 A snorkel trip to the nearby reefs in Miami must be done by boat. Luckily, options for snorkel trips abound as do the number of fantastic sites along the reef. Normally, the snorkeling tours go to the protected inner reefs and stick to sites with depths ranging from as shallow as 5 feet to 15 feet. The boat ride to the reef takes between 30 to 45 minutes depending on the snorkel site and allow about one hour in the water. Some operators also offer "extended" tours and visit a couple of different snorkel sites. On average, you should allow a minimum of 3 hours for a one-site snorkel tour. Each snorkel tour begins with a briefing conducted by the crew who will make sure everyone has his/her proper snorkel equipment and provide with snorkeling tips such as clearing your mask, swimming with your fins, as well as instructions for entering and exiting the water. As this is a protected area, the crew will also remind you that you are not allowed to touch or take anything from the water, and much less stand on the reef, which believe it or not, we have seen many do, please don't be one of them! They will also cover some aspects of the reef and the marine life you are likely to encounter. Snorkel Tips and How To Choose a Snorkel Boat Tour Operator? Some operators provide all the necessary gear, some charge an additional rental fee, so if you are not bringing your own be sure to check what's included in the price. 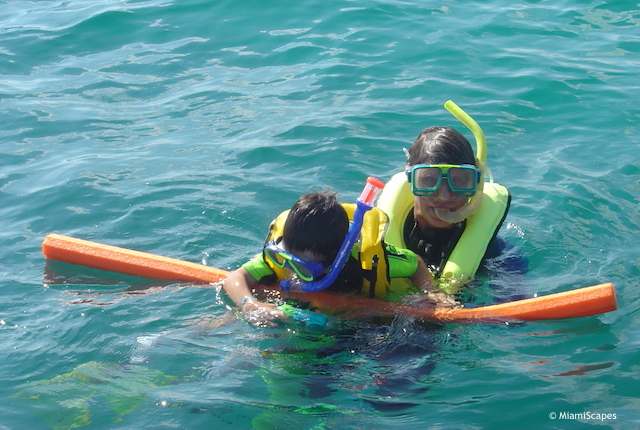 Besides mask, fins and snorkel, safety vests are provided (and required in the water) by the snorkel tour operators. Personally, I think it is worth buying your own mask and snorkel. You can buy a set from Sports Authority or even a Walmart from cheaper than you can rent two times. But the real advantage even if gear is included in your tour price is in getting something that fits well and that you can become familiar with. Some operators conduct snorkel and dive charters together, if at all possible, if you are a snorkeler, try to go on a "snorkel only" boat, if you are a diver, you should get on a "divers only" boat. Most boats that cater to both groups, end up with waters that are either too shallow for divers or too deep for snorkelers. If you are snorkeling with small children that might get tired, stop by the Walmart or Publix and get one of those floating sausages to use for support and rest. It's a well invested couple of dollars! Most shops and operators are well-assorted and will have children masks, fins and vests available but be sure to ask in advance if you are not bringing your own. Snorkel and Dive operators open, close and change ownership and management with regularity in the Florida Keys. It is a good idea to check the latest reviews rather than the overall rating from fellow travelers when considering your choice of snorkel tour. We provide you with links on the table below so you can check people's experience with a particular outfit. A starting point for a snorkel outing could be one of our popular State or National Parks which are worth a visit on their own right: Biscayne National Park and John Pennekamp Coral Reef State Park are top choices. 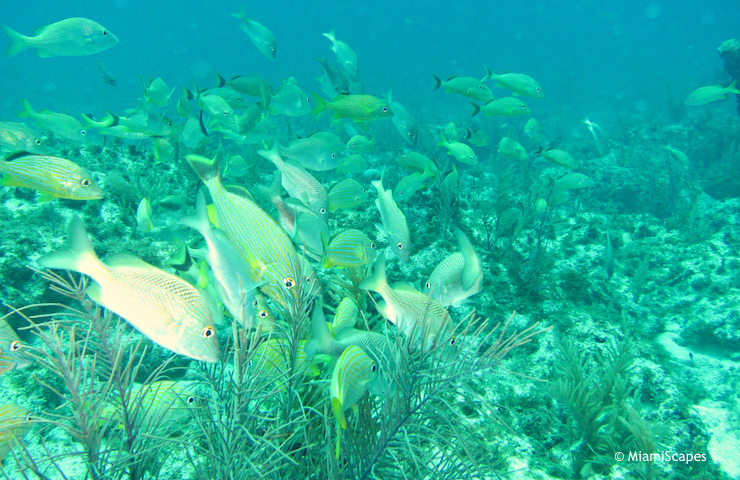 Over 95% of Biscayne National Park is in the waters of Biscayne Bay, so naturally, snorkeling at the Park is quite popular. It is just amazing that so much color and life can exist so close to a mega city like Miami, the park is only a half-hour away from the hustle and bustle, practically next-door. Snorkeling in Biscayne National Park is spectacular with crystal clear waters, colorful and healthy coral reefs brimming with marine life, and shipwrecks that lie in relatively shallow water. The Park's Concessioner provides year-round daily snorkel tours to the reefs. The boats leave from the jetty at the visitor center. Pennekamp is one of our favorite parks to chill for a day. It is about one hour south of Miami in Key largo, practically at the entrance of the Florida Keys. 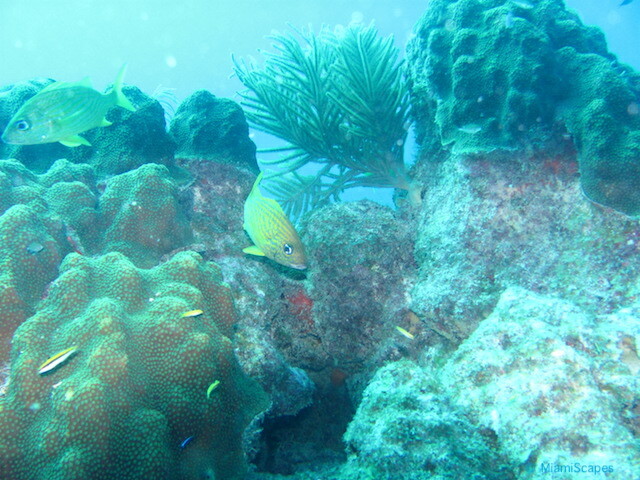 Not only is the snorkeling and scuba diving fantastic, the park has much to offer to nature and outdoor lovers. There is canoeing, kayaking, glass-bottom cruises, excellent facilities and a fantastic visitor center including a massive 30,000 gallon saltwater aquarium. 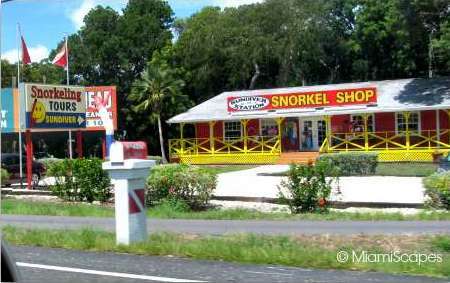 The park's main concession shop runs Snorkel boat tours several times per day. The facilities, boats, and rental equipment are top notch. There are also three small beaches at the park where you can certainly snorkel from shore, but the snorkeling is dull when compared to the reefs. For first timers, it is a great option to have to try out your snorkel gear, fit your mask and practice a bit before jumping from the boat. Other popular options are a short drive away in the Florida Keys. Key Largo, the closest to Miami, is dubbed the "Diving Capital of the World" and that goes also for snorkeling. As soon as you drive over the bridge, there will be snorkel and dive charters galore beckoning with snorkel trips departing throughout the day. Here's a table of snorkeling tour boats around Miami and we have tried to sort out the basic considerations, is it a snorkel-only boat? is gear included or extra? are tours guided? and other info particular to the operator. Although not at all comprehensive (we're still working on it) it can get you started! 2 1/2-hour and extended 4-hour tours available. Wheelchair accesible. Guided, Group and Private charters also offered. Snorkel Boat Tour includes snorkel gear. Offers snorkeler-only tours. Regularly scheduled tours to Christ Statue. These are guided snorkel tours, i.e. a guide for each 6 snorkelers gets in the water to lead you around. First time? FREE classroom lesson before your tour. Includes snorkel gear, in-water photo guide and disc of the days photos. While not spectacular, and as long as you are not expecting colorful corals and tropical fish in abundance which you find at the reefs, there is still plenty to see while snorkeling from the beaches in Miami. Here are some of our favorite spots to snorkel from shore around Miami.